Digital printing is what keeps printing services alive. It’s what enables companies to offer better quality, more features and greater flexibility at lower costs. Automation and streamlined workflows also help to lower costs and improve efficiency in creation and manufacturing processes. These days, print is so much more than CMYK. CMYK is a model used in color printing, referring to the four primary inks used in color printing: Cyan, Magenta, Yellow, and Key (Black), and the variations that create an endless array of colors. The move to digital print and digital enhancements brought us a new range of colors, such as metal inks, dry ink and White ink. Let’s have a look at them. Specialty dry inks offer an increased color gamut and improved efficiency, without having to compromise or choose between quality and speed. You’ll be able to provide shorter runs, quick turnaround and high quality. You can also include print on demand services and offer improved options for last minute printing jobs. Advanced automation and streamlined workflows also work in favor of smooth print jobs, and all-in-all, dramatically improve running costs, productivity and business supply chains. The latest craze is metallic silver and gold prints, also created using specialty dry inks. Stunning metallic inks can be produced on the Xerox Iridesse production press, incorporating flecks of metal to deliver outstanding image quality with a true metallic appearance. 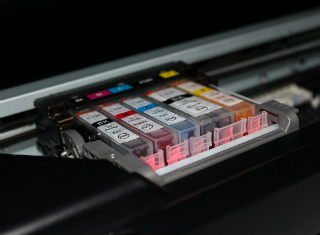 These inks deliver great results in a single pass, saving money and resources and helping print companies to take on shorter digital jobs without compromising on quality. A recent design feature is the White dry ink which brings plenty of opportunities when designing printed applications. It is now possible for print providers to create special designs, apply special spot effects and transform an ordinary printed piece into a unique product. With these new advancements, it is clear why digital print is moving beyond CMYK. With potential profit margins on digital print enhancements as high as 400% (according to a study by InfoTrends), it’s an opportunity you wouldn’t want to miss and an investment worth making.